When the mine was forced to close in 1942, the once thriving community became a ghost town. Protected by a series of caretakers, the Vulture is on the best preserved authentic ghost towns in the west. On vacation in 1995, we paid our fee and set out on a walking tour of the mine. We had the good fortune to encounter one of the Vulture's characters, Russ Hunting. 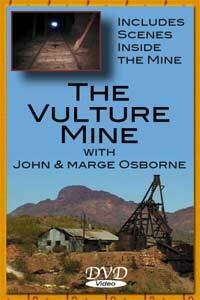 He began vividly recounting the legends of the Vulture Mine in a highly animated fashion. Russ brought the Vulture to life for us during our first visit. He allowed us to tape him including his personal encounter with the Vulture spirits. He died a few months later and his ashes are scattered at the Vulture at his request so he could "be with his friends". The following year we met John and Marge Osborne, the Vulture caretakers. John suggested a tour video for people who were unable to manage the Vulture's site's long treks. As we got to know the Osbones, we realized that they were as much a part of the Vulture's history as Henry Wickenburg. What we set out to capture the experience of be taken on a guided tour of the mine by John and to spend an afternoon sitting on the porch talking to this engaging and interesting couple. Now that John has passed away and Marge no longer lives at the mine, we feel honored to have had opportunity to capture and preserve this slice of American history.